Most of you who read this blog know how much I love sweets, and in particular, chocolate. Like raving, will do anything to have it type of love (except for milk chocolate, which is just so-so in my book, or white chocolate, which isn't really chocolate at all). It may surprise you to know, then, that my favorite dessert of all time has nothing at all to do with chocolate. 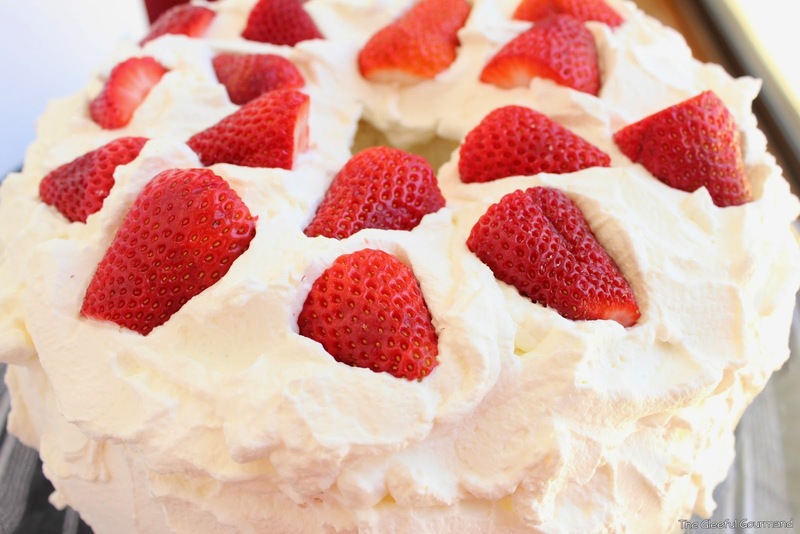 It's my mother's Strawberry Cake. It is quite simply one of the easiest cakes to make known to man. But don't be tricked into thinking that because it's easy it doesn't taste exceptionally good, because it does. My mom has been making it since I can remember (especially as the crowning end to most of our Easter feasts) and her mother was the one who started making it first. That's a fine pedigree as far as desserts go. So what makes it so great? It's an angel food cake with whipped cream, and fresh strawberries. Anybody can do that, right? Your local grocery store could do that for you with a plastic-wrapped angel food cake and a tub of cool whip. But it wouldn't be the same. And it certainly wouldn't have the wow factor when you go to present it. What makes this cake so great is its freshness. Making your own whipped cream is essential. And nothing goes better with whipped cream then fresh, ripe strawberries. The process: Removing the top layer of the cake, creating a well, filling the well with cream and berries. 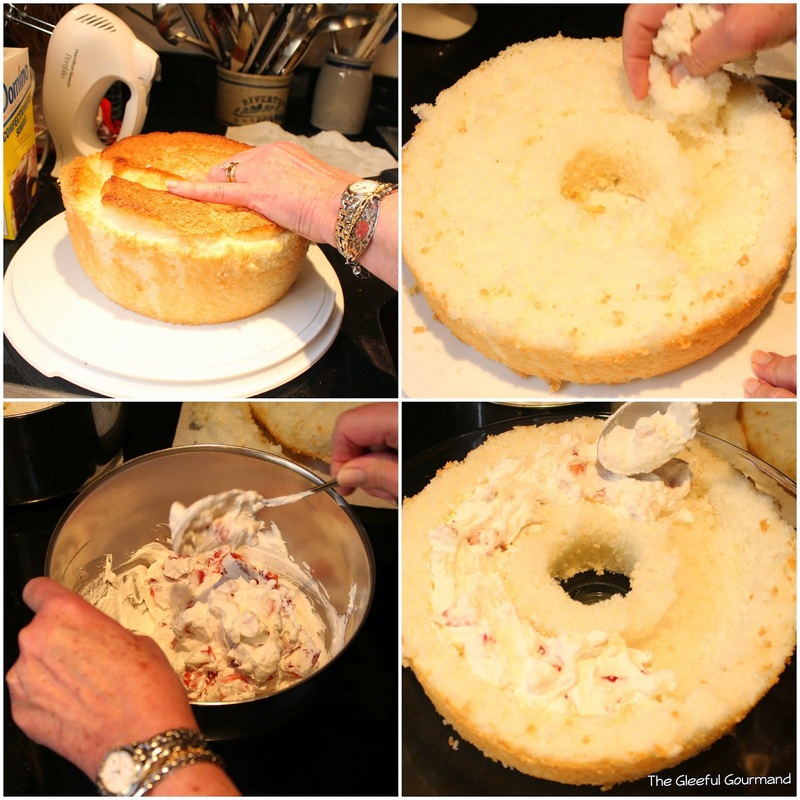 • Make the Angel Food Cake to the specifications on the back of the box. Let cool, inverted, completely. When cooled, using a bread knife, slice the top off about 1 inch from the very top, no less. Lay the top very careful to the side (a clean countertop or paper towel would be fine). • Using a serrated knife, gently make a well around the circumference of the cake. Do not go through the bottom of the cake. Pull out some of the cake leaving the sides and center sides of the cake (look at the picture above, it explains it better than I can). • In a cold bowl, whip chilled Heavy Whipping Cream until soft peaks form. • Quarter one cup of strawberries. Fold into about one cup of whipping cream. Spoon mixture into the well. Replace top of the cake carefully. 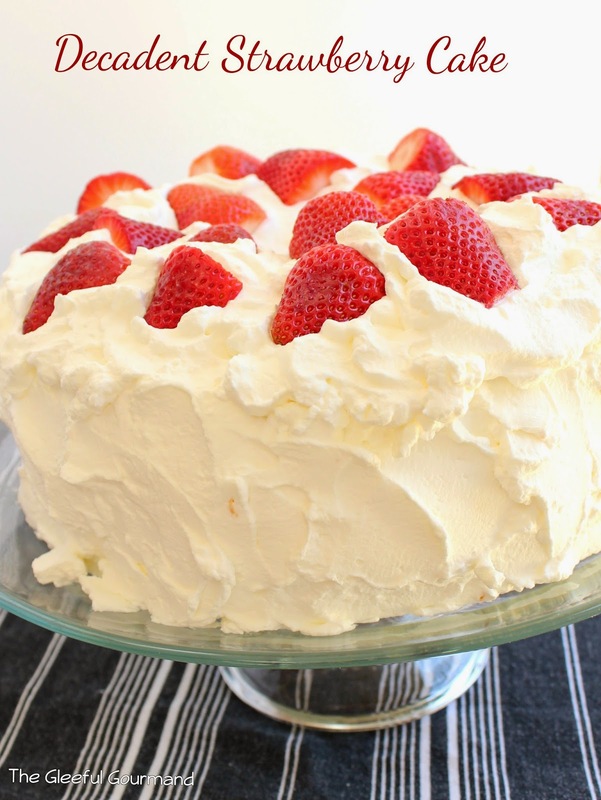 • Frost the cake with the remaining whipped cream, and place halved strawberries on top to suit your fancy. My grandmother also loved to make a variation on this cake using chocolate whipped cream and slivered toasted almonds. That's always been a favorite combination of mine, but since we have nut allergies in our house, I thought it would be fun to try chocolate whipped cream with halved raspberries in the well, and raspberries on the top of the cake. To get chocolate whipped cream the way my grandmother made it, you simply add about 1 1/2 Tbsp. of cocoa powder, and maybe a little bit more confectioners sugar, and maybe even a dash of vanilla extract. Enjoy! Sounds delicious! But my only question is: I thought baby bundts were your favorite?! ?